NoteBurner M4V Converter: Convert DRM M4V movies on Windows. "Can I watch iTunes movies on my tv via wii? Just wondering if I can watch itunes purchased and rented movies on my TV via a new Wii I'm buying for my family." The Wii is a home video game console released by Nintendo in 2006. 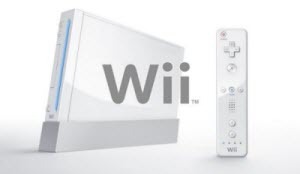 As a seventh-generation console, the Wii plays the same role as Microsoft's Xbox 360 and Sony's PlayStation 3. Though both of the Microsoft and Sony has upgraded their home video game console product lines in the first half of 2013 with Xbox One and PlayStation 4 with more powerful specs, Nintendo's Wii series has also gained millions of users by announcing the Wii U in November of 2012. To answer the question above, we need to figure out what the iTunes movie is first. If you are one of a movie lovers, you may usually bought Blu-ray or DVDs to enjoy the movie at home. iTunes offers a different way for you to enjoy popular movies at home. You can download almost all kinds of movies from iTunes store and play them as soon as you purchase them with a relatively cheap price. However, these movies are only allowed to be played via iTunes or on Apple devices like iPhone, iPad and iPod Touch. Due to the DRM protection which has been packed in these movies, other video player is not able to play iTunes M4V movies theoretically. So, though Wii can act as a useful video player as well as a game console, it is impossible for Wii to directly play iTunes movies. It seems that one of the effective way to enjoy iTunes M4V movies on Wii is to remove the DRM from iTunes movies and convert M4V to common video format like MP4, MOV for playing via Wii. NoteBurner M4V Converter Plus (For Mac & For Windows) is recommended as the best iTunes DRM video converter on Windows. With this powerful iTunes M4V to Wii converter, you can convert iTunes M4V to various video formats for playing on Wii. 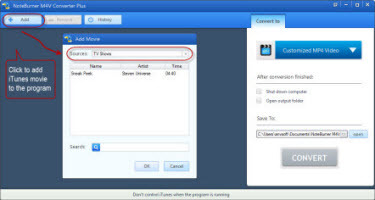 Guide: How to convert iTunes M4V video for streaming to Wii playback? NoteBurner iTunes M4V to Wii converter supports convert iTunes rentals as well as iTunes purchases. Click add button on the main interface and then the iTunes library would pop out for you to choose M4V movies from. Click profile button to choose a output format for playing on Wii. The Wii supports many video formats for playing, so you can freely choose one format from profile menu. Here we recommend you use Same as source video MP4 profile for converting to keep high quality of the original movie. After settings have been set, click the big convert button to start to convert iTunes M4V to Wii MP4 video. Once the conversion is completed, you can click the location button to find the converted MP4 videos and transfer them to Wii for playing.